This battery charger is an AC wall and DC car two in one charger. 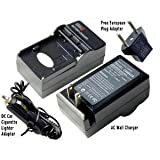 Its unique flat pin, foldable design allows easy storage and makes it a compact battery charger. Smart charging LED indicator automatically turns to trickle charge after the battery fully charged. Note it is an external battery charger only, not working as power cable or AC adapter.